I know this blog is all about cooking recipes from cookery books, but I’ve also found that there are a wealth of great recipes to be found online or in supermarkets. They do tend to favour the meat eater but there are good vegetarian ones out there too if you look hard enough. The recipe suggests boiling then frying the sweet potatoes, but I prefer the leave the skins on the sweet potatoes and roast them as they become much softer, sweeter and intense. I also prefer to swap couscous for Quinoa cooked in bouillon as it is much higher in protein and gluten free; so ideal if you have vegans in your home. Bouillon really adds flavour to grains like quinoa, pearl barley and bulgar wheat. Looks beautiful doesn’t it. Really colourful and inviting. And what’s more all the ingredients are readily available from your favourite online supermarket. There are so many textures and flavours going on in this recipe. 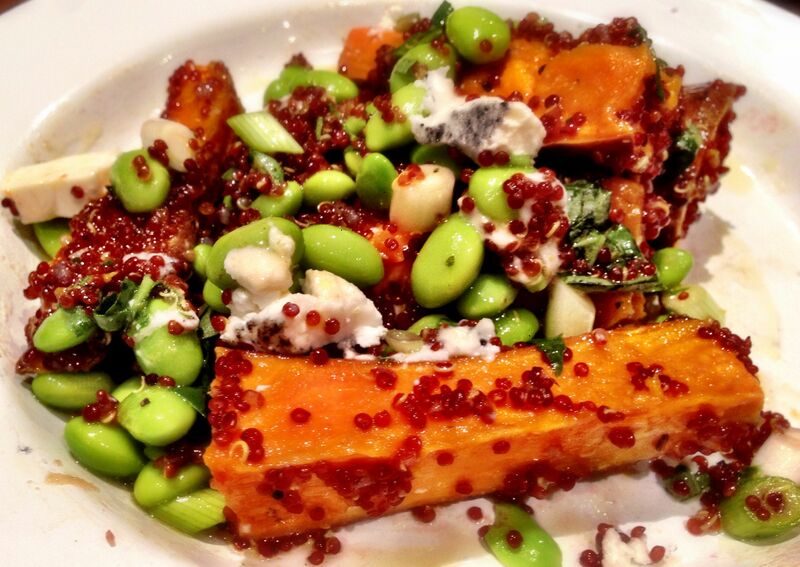 Quinoa, sweet potatoes, edamame beans, spring onions, basil and rosary ash goats cheese. The orange and basil dressing adds a lovely citrus hit and the goats cheese is incredibly creamy – hmm its just so yummy and is very filling – and I know I’ll make this regularly. You can eat this dish hot or cold, and it keeps really well too – so if you have leftovers you can take some to work the next day and have your work colleagues drooling as they eat their ready meals and sandwiches! If you want to add a crunchy topping for the salad you could try roasting some pumpkin seeds in tamari soy sauce. I made them in an earlier recipe. They are really intense. I like to make lots and graze on them during the day.